When decorating for your next party, add a burst of color and interest to an ordinary flower centerpiece by using cranberries to perk it up. Although often associated with Thanksgiving and Christmas, cranberries work well anytime of the year when making floral centerpieces. They also work well with various types of flowers and in all types of clear vases or containers. Select a tall glass vase approximately 4 inches wide and 10 inches tall. You can use any size, depending on what you have and the look you want for your floral centerpieces. Do not use a narrow vase. Fill the vase with cranberries to within 2 inches of the rim. Use firm, fresh cranberries, as they last longer in the centerpiece. Add water to the vase, filling it about half full. Always start with less water, as it's easy to add more later on. Select the flowers you wish to use for the centerpiece. Consider flowers that have sturdy stems, such as roses, tulips, Gerbera daisies and irises. Measure the height of the flowers against the outside of the vase and cut accordingly to the right size to fit in the vase. Cut the stems at a 45-degree angle so they soak up the water better, keeping the flowers fresher. Insert the flowers into the vase, gently pushing the stems down through the cranberries to secure them. Once all the flowers are arranged as you want, add more water to fill the vase to within 1 inch of the rim. 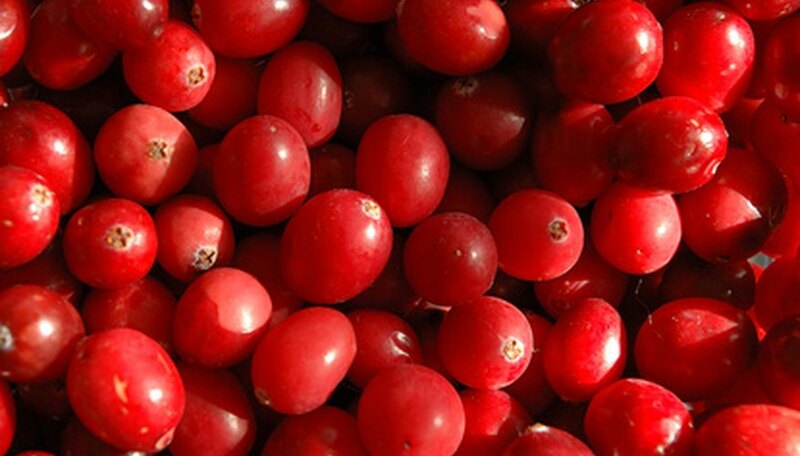 Use white flowers to contrast with the red cranberries or use various shades of red to complement the cranberries.